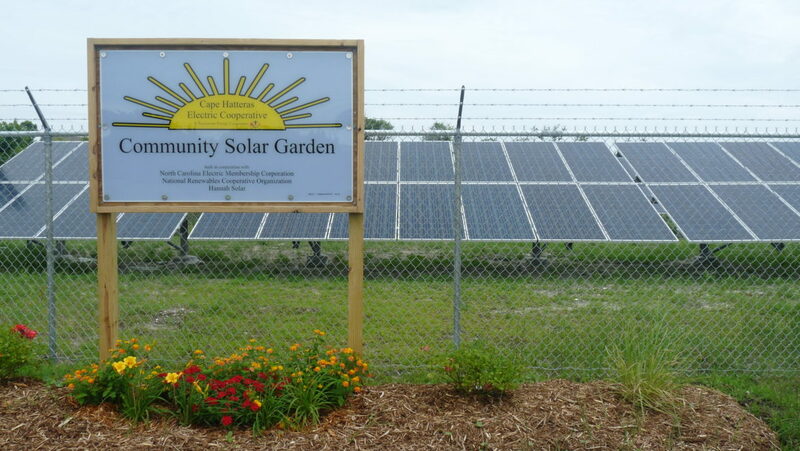 A community solar garden in Cape Hatteras, North Carolina. Nelle Hotchkiss is an executive at North Carolina’s Association of Electric Cooperatives. While much of North Carolina’s energy focus is on Duke Energy, advancements made by the state’s 26 electric cooperatives, should not be overlooked. Co-op officials say their organizational structure allows them to be nimble, enabling them to incorporate new technology more quickly than large investor-owned utilities, technology that gives consumers added control while helping them to become more energy efficient. And, what they’re learning from a couple of microgrid pilot programs will guide their future renewable energy investments. To learn more about North Carolina’s co-ops – which serve roughly a quarter of the state’s population, Southeast Energy News asked Nelle P. Hotchkiss, Senior Vice President of Corporate Relations at North Carolina’s Association of Electric Cooperatives, to participate in a Q&A. Southeast Energy News: What prompted the creation of electric co-ops in North Carolina? Hotchkiss: The history of cooperatives dates to the Great Depression. Part of Franklin Roosevelt’s New Deal was to electrify the countryside because as the country’s economic position improved rural areas were being left behind. Initially, investor-owned utilities were offered incentives from the federal government, but the economics didn’t work – it takes a lot infrastructure to distribute energy to rural areas, and the customer base is less dense. Ultimately, electric co-ops were started by the very people who wanted the service. In 1936, the Edgecombe-Martin County Cooperative was the first electric co-op in the state. That was back when members had to pay $5 to join, which was a lot of money in those days [roughly $87 in 2016 dollars] – so it was a big deal. How to co-ops operate in their communities today? North Carolina still has a lot of low-wealth, rural communities. Our customer base – our member-owners – are about 90 percent residential and small business, though we do have some large customers on our lines. We’re not only the electric company but we are also economic engines in our small communities. We pay attention to more than just electricity and try to help the communities we’re in thrive, or even recover from things like hurricanes and the Great Recession. We offer programs and innovative financing to help with economic development and even with access to quality education like through our Bright Ideas grant program that helps offset costs for some classroom projects. What is the North Carolina’s Association of Electric Cooperative’s role? Based in Raleigh, NCAEC provides multiple services for the co-ops; we’re the co-op’s co-op. Compared to an investor-owned utility, we’re completely inverted; we’re owned by the 26 co-ops across the state and they tell us what to do. So, it’s the opposite of the structure of a corporation. This enables North Carolina’s co-ops to pool resources. For example, NCAEC might hire an energy expert that all the state’s co-ops can work with, which avoids the expense of having 26 different experts on the same topics at each organization. Where do co-ops get their energy? We do buy power through contracts from Duke Energy and other providers, but we are also the majority owner of the Catawba Nuclear Plant in York, South Carolina. Energy from the nuclear plant and our contracts with investor-owned utilities make up more than half of our portfolio. Due to a decrease in coal generation, 28 percent of our energy mix is derived from natural gas – and that’s rising. Hydroelectricity makes up three percent, and renewables make up another three percent – and that is also rising. How are co-ops incorporating renewable energy and efficiency into their mix today? Today, we have 14 community solar projects online, with four more that will come online by the end of the year, that represents 2 MW of energy production. Most members can’t afford to install renewable energy sources at home, but they can buy into a community project that helps to reduce their footprint. And the projects allow us to continue improving our position with renewable energy. We’re also trying to improve our members’ ability to use their energy more wisely, or to control their energy use, through energy efficiency programs and load-management programs that allow us to manage costs and risk better. What’s on the horizon for North Carolina’s co-ops? Consumers’ expectations are continuing to rise. Part of that is due to social media and mobile communications – it’s a whole different environment now; our member-owners are exposed to the same information and opportunities as the people who live in large cities. They want us to continue to innovate and embrace technologies that can help them use energy more wisely and to manage costs better. For example, most co-ops now allow consumers to pre-pay their energy bill, which helps people who are paid on a weekly basis to manage their cash flow. They then become self-selective conservationists because they become aware of the energy they’re using through automated meter information that is available online, and they like that; it’s become one of our more popular programs. What other technological advancements are available to cooperative members? We’ve initiated several pilot projects to test how new technologies and resources can be integrated into our system to reduce costs and better serve our members. For example, we’re in the early stages of a pilot with “smart” thermostats that can automatically adjust temperature settings, reducing energy use for heating and cooling. Members can control them from their cell phones, too. Plus, during times of peak demand when electricity is most expensive, the co-ops can signal the thermostats to adjust slightly, curtailing demand on the system. When all participants work together to reduce demand in key moments, it can mean real savings for the cooperative. We’re also developing two microgrids to learn how to optimize distributed energy resources; we’re smaller, so we’re nimble and that allows us to work on these pilot programs in a way that’s more difficult for larger companies. In fact, we’re working with Tesla and other battery companies, offering them feedback to help them improve their product. One of our microgrid projects is on Ocracoke Island, which is served by Tideland EMC. Designed to operate in parallel with or independent of the electric grid, the Ocracoke microgrid pairs solar, smart thermostats and battery storage. By interconnecting these resources, we hope to better manage load and increase reliability. Beyond that, it helps us understand how these resources interplay with the existing grid, which helps us learn how to optimize them. What we learn will guide our future investments and integration of renewables. Technology is driving change in our industry, and all the changes that have occurred over the last decade have had something in common: they engage the consumer.